The Sacellum of Boethiah is the shrine for the Daedric Prince Boethiah located in the mountains directly east of Windhelm on the map. It is composed of three levels, and all of them seem to be abandoned and burned. There are blood stains on the ground and burned corpses around the shrine. All of it looks like a dragon raided the place not too long ago. On the lowest level, there is a tent and some bedrolls, as well as some kind of small arena. There are also packs near the tent, with three bottles of skooma found in one of them. On the mid level, there is a tent surrounded by cages. Inside the tent, there is an Alchemy Lab and an Arcane Enchanter. On the highest level is the actual shrine, which has a mysterious pillar in front of it. If you have a follower with you inside the circle, you can activate the pillar. Tell your follower to use the pillar and they will be drawn towards it. This allows you to kill your follower and loot their corpse without consequence. There's also a tanning rack nearby. If you are level 30 or higher, then there are a number of Boethiah Cultists, and a Priestess of Boethiah present at the shrine. Speaking to the Priestess will start Boethiah's Calling if it has not already begun. 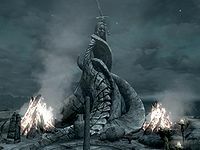 The magic pillar is surrounded with spiral Daedric carvings on the ground and some kind of magical channel that lights up when you enter its zone. It's a direct quote from the book Boethiah's Proving. Boethiah's Calling: Become Boethiah's new champion. As you climb the mountain path to the shrine, no matter what time of day it is, the sky will darken rapidly and appear as if it were night. Two gold ore veins are located 300 ft south-southwest of the Sacellum, right next to a small den of snow bears. This page was last modified on 28 October 2016, at 23:01.